Chances are, if you know even the slightest about anime or have watched even a few shows, you are familiar with Takanori Nishikawa, or, better know by his stage name, T.M. Revolution. He has contributed songs to countless animes, most notably Mobile Suit Gundam Seed and Ruroni Kenshin. In 2003, TMR made his North America debut at none other then Otakon. 10 years later, he has returned to help celebrate Otakon’s 20th anniversary year. Panel: During his Q&A panel on Friday, T.M. Revolution spoke of what he has been doing since his last appearance at Otakon in 2003. He talked about being a member of the music group, abingdon boys school, working on charity work, and being named the Tourism Ambassador of his home town, Shiga Prefecture in Japan, even creating a rock festival! He’s been keeping busy! After the earthquake of March 2011, TMR created the charity group called “Stand Up! Japan”* to help those in need. Many other musicians and artists are helping him with this charity effort. He emphasized the longevity that would be needed over time, and it is an on going effort now and in the future. TMR thanked “each and every one of you”, and everyone worldwide, who helped Japan out after the earthquake, both by donating and giving words of encouragement. The panel also featured questions from fans, and a trivia contest where winners received a poster handed to them by Takanori himself! 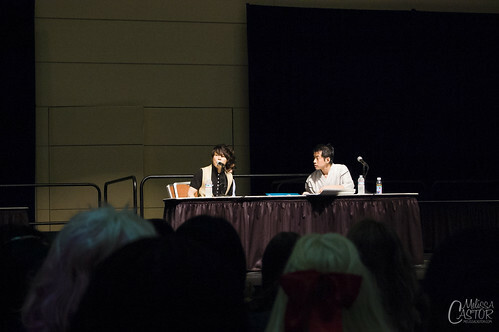 For the full panel report, please see Otakon 2013 – T.M.Revolution Q&A. Concert: Saturday afternoon brings us to the concert. After a short intermission following Home Made Kazoku’s set, T.M.Revolution took the stage of the 1st Mariner Arena of Baltimore, Maryland. As the lights went down, every fan in the arena stood up from their seat, eager to see TMR’s performance. 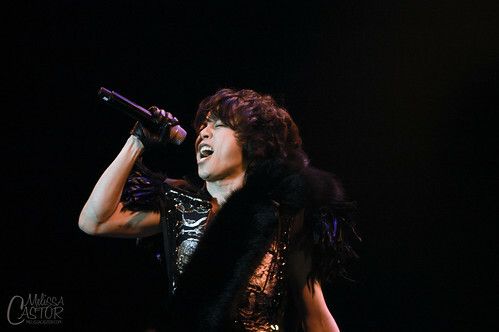 If there is one word to describe Takanori, it would be fabulous. He came out wearing a loose fitting top, feather boat, a fur wrap, a gold and black shirt, over the knee boots, and lets not forget the gloved hands. He would give Michael Jackson a run for his money in the wardrobe department. T.M.Revolution has a fantastic stage presence and such a high level of energy that only builds upwards as the show presses on. If one watched his face closely, you could see the dramatic range of facial expressions he made as he sang, putting a lot of passion into his work. He danced and headbanged along to his own songs as he sang. TMR took advantage of the runway multiple times throughout the evening. What was even better then him coming close to fans was his return to the main stage. There was a risen box for him to stand on, and each time he returned from the walkway to the stage, he not only jumped over this box but almost flew over it! Of course, it was also always timed perfectly with his music. 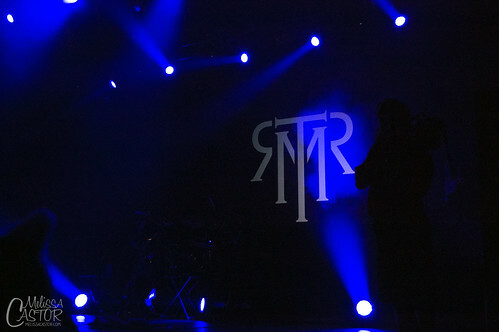 T.M.Revolution stands for Takanori Makes Revolution; his band was very talented as well! Even as all eyes on him, his band was just as great to watch, never missing a string or drum beat. He introduced all the members at the end of the show, being sure they were not forgotten or left out. As the show progressed, layers of TMR’s outfit slowly disappeared, revealing his top was completely backless! He also appeared to become happier as the show went on, enjoying himself and feeding off the energy surrounding him, a smile plastered to his face. During the show, he once again addressed the March 2011 Japan earthquake, speaking first in English and then in Japanese. Even if fans did not know what he was saying, the compassion he felt for the cause went straight to the heart. Appropriately, “Heart of Sword” began right after his speech. 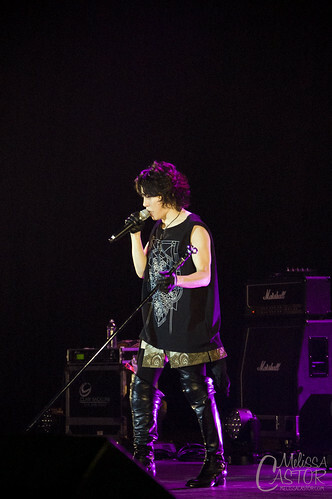 Towards the end of “Heart of Sword”, TMR walked to the end of the run way, and dropped his mic to the ground. He proceeded to shout the words, fans singing along with him, amazed at this beautiful performance. It was unexpected, but gladly accepted, surprise to end his solo set. 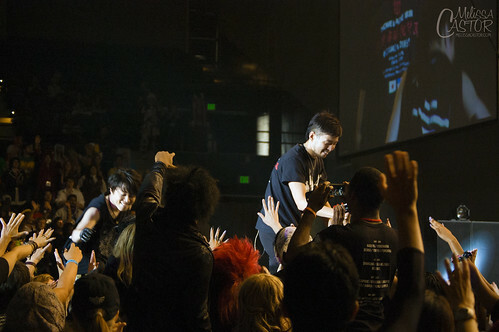 TMR thanked the audience again, “I love you Otakon!” before walking off stage. Nobody expected him to be gone for long though, as chants of, “TMR! Encore!” immediately began in the audience. He did not disappointed and returned just moments later in a black tour t-shirt (Japanese tour, not for sale at the convention, sadly) as his band returned out in white tour shirts. Thus started the song, “The party must go on” and it did indeed go on. TMR x HMKu collaboration: The moment everyone had been waiting for finally arrived – the TMR x HMKu collaboration! 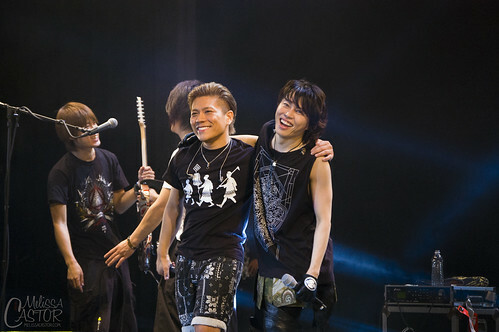 “Let’s call back on…Home Made Kazoku!” The members of Home Made Kazoku returned to the stage, in their band Otakon specific t-shirts, all hugging Takanori, huge smiles on everyone’s face. “Are you having fun?” Takanori gave a MC in Japanese before saying, “Last song for you.” Micro and Kuro started out the song with a rap, along with the audience clapping along. 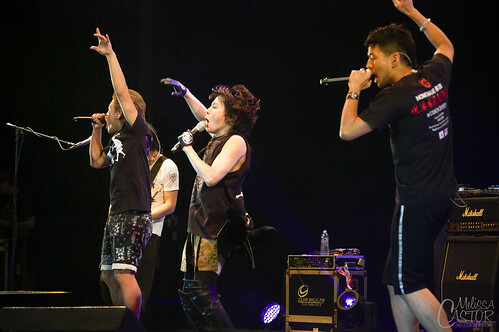 The three vocalists moved in synchronization around the stage with each other, DJ U-ICHI back at the mix table, and Takanori’s band – a full stage, to say the least. The guys sang and rapped together as the crowd jumped along to the beat. When the singers crossed paths, they would interact either by hugging each other, smiling and dancing together, or even form a circle in sing in unison. As the three went out onto the runway, the audience was greeted by every color confetti exploding above their heads. It was an experience and collaboration unlike Otakon has seen before! TMR proceeded to pull his t-shirt over his head, covering his face and raising his arms in the air. Micro stood nearby and burst out laughing, almost to the point of tears, obviously not expecting this. The screams that could be heard meant this gesture was appreciated by adoring onlookers. Everyone on stage placed down their instruments and walked to the end of the runway, giving high fives or shaking hands along the way. 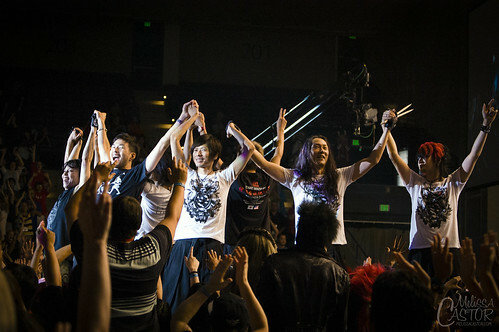 As is usual at the end of Japanese shows, all band members proceeded to hold hands, raise them up, and then bow, once again thanking the audience and hoping they enjoyed the show. “I hope to see you again! Thank you! 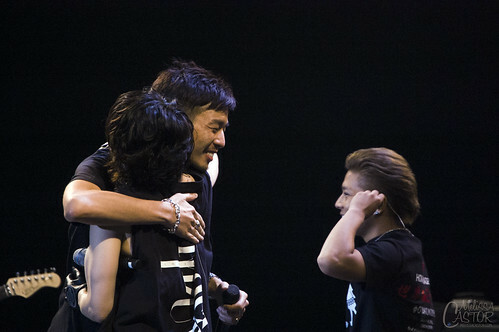 I love you!” Takanori shouted before he finally, regretfully, left the stage. 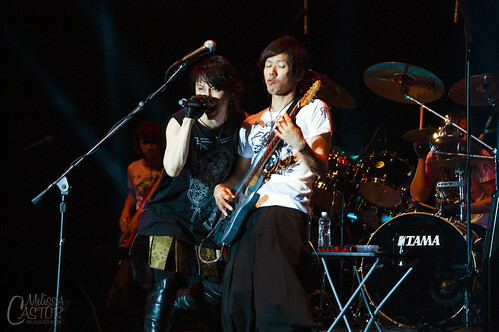 It’s been 10 years since TMR was last at Otakon, and 3 years since Home Made Kazoku – judging by the audiences reaction, they would be more then thrilled to see both artists back in the States again sooner rather then later. This concert, especially the collaboration, is not one that will easily be forgotten. 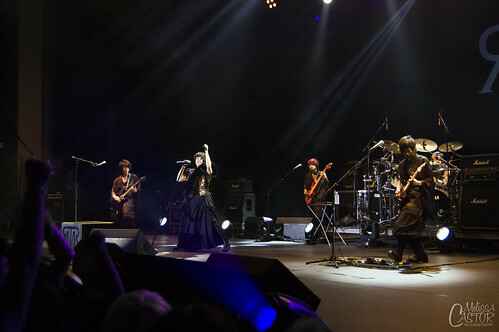 For full set of concert photos, please see Otakon 2013 – T.M.Revolution Photos!